When it comes to evacuating a building, all companies and organisations need to be prepared for any eventuality to get everyone evacuated safely. With this in mind, extra precautions need to be taken into account to accommodate wheelchair users and the mobility impaired, ensuring the risk level when evacuating is reduced. United Kingdom based Evac+Chair is the world’s leading supplier and original manufacturer of evacuation chairs. 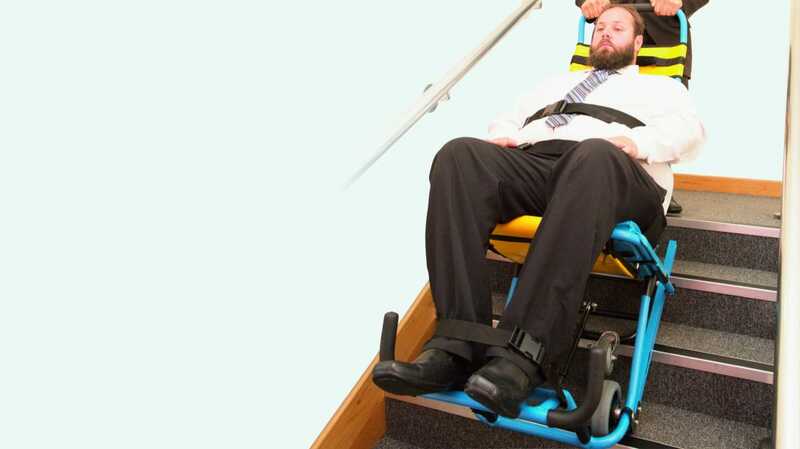 The chairs are designed to accommodate disabled or the mobility impaired, allowing them to descend staircases in an emergency evacuation without the need for great physical strength or lifting. However as nearly one-third of the world’s population is obese or overweight according to the Global Burden of Disease Study, this can be an issue that employers need to be aware of when implementing evacuation plans. The Evac+Chair 500, which is manufactured in the heart of the England, permits the safe exit of mobility-impaired passengers up to 227kg from a building in the event of emergency. As well as the increased carrying weight, the additional design feature helps the smooth transportation of passengers on steep inclines of up to 45° to reduce the strain on operators when manoeuvring heavier individuals from a building. The lightweight frame has generated additional weight savings to accommodate supplementary features such as a foot rest and foldaway handles for extra support. With a wider set frame and padded patient restraint straps, the chair is able to safely transport any individual below the specified weight to safety with ease. The chair is suitable for one, two or four person operation, depending on the size and weight of the individual being transported, and the unique self-braking friction tracks ensure smooth transportation and negates the need for heavy lifting. The Evac+Chair 500 overcomes the worries felt by the industry when employers adopt a ‘one size fits all’ approach to evacuation, which could leave employers in breach of the Equality Act 2010, by not having adequate evacuation arrangements for the mobility-impaired.